Ah, back to school….how are we all doing? Things are gettin’ real, right? No more icebreakers and settling in, it’s go time for school psychologists. You start having days at your school site where everything that could go wrong does and you run around putting out a hojillion fires and then you look at the clock, ready for lunch and its 3pm. What do you get in your Basket O’ Survival? -An autographed copy of my book, The School Psychologist’s Survival Guide! –Margarita Mix Sorry, inappropriate! You’ll have to sponsor your own happy hour. -A pack of trail mix for when it’s 2:29 pm and you haven’t had lunch yet and you have an IEP meeting in one minute. Easy to snarf down on the go for quick protein. -Stickers and a reward chart (for the little friends who need a little extra sumthin’ sumthin’ to get through the Test of Auditory Perceptual Skills or the CTOPP). 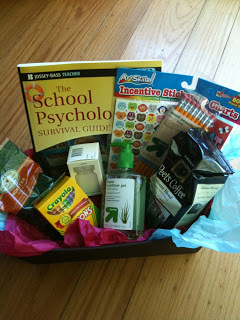 1) Follow me on Twitter @studentsgrow and post why you neeeeeeed the School Psychologist’s Survival Guide Basket. Be sure to tag me in the tweet at @studentsgrow. If you are already a follower, the just post n’ tag. 2) Post a link of you favorite post from the history of the blog on twitter to your followers and tag me @studentsgrow. Go forth and enter to win! Your very survival depends on it! *Thanks to Musings of An Urban Psychologist for the fab idea to put my book in a basket of other survival goodies! Comments on You Want This Prize. I made my own school psych survival kit for one of my friends when she graduated in May. I included your book, a bottle of wine, starbucks gift card, thank you notes, and a picture frame to spruce up her new office space. Just a thought: giveaways are lovely when they are just giveaways. I don't enter them when they are tweet me post me follow me extra extra entry giveaways. They feel kind of hollow when they are just for marketing.